The Society was founded in 1969 by a small group of dedicated breeders who were concerned at the reducing numbers of pure bred sheep. The first President of the Society was the Dowager Duchess of Devonshire who had a flock at Chatsworth in Derbyshire (below). The Society is a registered charity No 1026687 and became a company limited by guarantee in 1979. 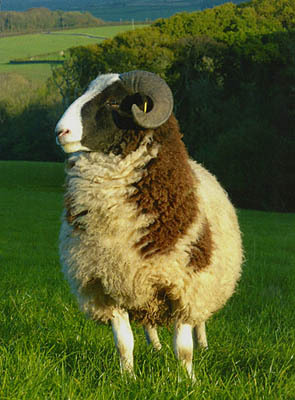 Its aims are to foster the breeding and promote interest in the Jacob sheep both in the United Kingdom and abroad. Its success has been achieved by the energy and enthusiasm of the members who are determined to maintain and improve the characteristics of the breed. By setting a breed standard for registered sheep, the Society has improved the size and conformation of the breed from the light boned parkland sheep to the sturdy commercial animal of today. The Society organise its own national sales where all entries are inspected to ensure that they comply with the breed standard. Newcomers to the breed can feel confident when buying stock at the official sales. The regions organise open days and similar activities where members can meet and have an enjoyable day of seminars and other activities, and can discuss issues or concerns with judges and field officers. The regions also hold flock assessments when member’s flocks are judged on the holding as a complete breeding unit. The Society encourages members to enter the show classes at local and national shows. Flock inspections as well as judging in the show ring are always carried out by experienced shepherds, appointed to a panel of judges by the Council. Staging breed promotion stands at major agricultural shows to promote the qualities of the breed and to advise prospective Jacob flock owners. 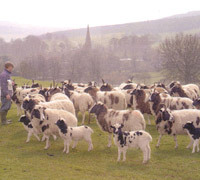 Producing articles for publication in the agricultural and smallholding press, to promote Jacob sheep and the range of products derived from them.